Resting at: Aurangabad Maharashtra, India. The Dargah of Khwaja Nizamuddin Aulia Aurangabadi (Qutub-e-Aaftab Qutub-e-Deccan Sheikh-ul-Islam) (R.A.) is situated at Shah Ganj Nizamuddin Aulia Road Aurangabad Maharashtra. Hazrat Khwaja Nizamuddin Aulia Aurangabadi (R.A.) is mureed and khalifa of Hazrat Sheikh Kalimullah Shah Jahanbadi (R.A.) situated at Delhi. Khwaja Nizamuddin Aurangabadi (R.A.)’s birth and early history is to some extent unclear, though it is known that he was a descendant of Hazrat Abu bark as-Siddiq (R.A.), the first caliph of Islam. His birthplace is thought to be kakor, India and it was there that he received his early education. To further his studies he traveled to Delhi, the center of learning at the time, and sought out a university. Word of the popularity of Hazrat Shah Kalimullah Jahanbadi (R.A.) reached his ears, and he decided to meet the great saint. When he arrived at the seminary of Shah Kalimullah (R.A.), he found the door locked, as the Sheikh was engaged in the spiritual musical assembly of Sama, to which outsiders were not permitted. Unaware of this, he knocked at the door and, to the amazement of the other disciples, was welcomed in by Shah Kalimullah (R.A.) and shown great love. Soon after, he enrolled in the great saint’s university. Initially, his primary aim was to obtain religious external knowledge only; but after a time the intense spiritual atmosphere that surrounded Shah Kalimullah (R.A.) drew him closer to the path of the Sufis. One day, as his Sheikh prepared to leave, Hazrat Nizamuddin (R.A.) came forward, dusted his Murshid’s shoes, and placed them before him. Upon seeing this, Shah Kalimullah (R.A.) inquired, “O Nizamuddin, have you come to acquire knowledge, or do you seek the path to Allah?” to this Hazrat Nizamuddin (R.A.) humbly replied, “you know better what is for me; you know better, for us, for me. “Upon hearing these lines, Shah Kalimullah (R.A.) recalled the prophecy of Hazrat Yahya Madani (R.A.) who stated that the one who would utter these words would be responsible for the spread and propagation of the Chistiya Silsila. Hazrat Nizamuddin (R.A.)’s spiritual instruction began immediately. Hazrat Nizamuddin Aurangabadi R.A.) was actively involved in the spread of Islam, and along with this he gave special attention to the spiritual training of his mureed’s. Historians have quoted the number of those disciples as being over one hundred thousand. At any given time after Salaat, about 300-500 people would gather in his Masjid for Zikrullah. Hazrat Nizamuddin (R.A.) was strict in his observance of the Sunnah of the holy prophet (Sallallahu Alaihi Wasallam). His concern for the welfare of the community, as we have seen above, was sincere and very great. He would always ensure that in whatever way possible he would fulfill the need of anyone who Shah Kalimullah (R.A.) him for assistance. The life of a saint is not only miracles and ecstasies; they live in the real world of ordinary mortals such as us, but yet transcend it, for they breathe Allah’s love with every breath. The beloved sleeps, covering her face with the beautiful locks of her hair. khusro, go home! The darkness of evening has engulfed the whole world. In this site check in the spiritual lineage after sheikh Kalimullah Jahanbadi (R.A.) Khwaja Nizamuddin Aaliya Aurangabadi (R.A.) is present. In many Sijras after Hazrat Kalimullah Shah Wali Khwaja Nizamuddin Aulia Aurangabadi (R.A.) is there. The information can be verified. Despite the name, which was provided on the Dargah and also the fact that the Hazrat Syed Nurul-huda Sahib (R.A.) is from both the Qadri and Chisti lineage, also provided on the signboard, little is known of this Dargah. The Dargah is very peaceful, clean and beautiful. Dargah of Hazrat Syed Nurul-huda Sahib (R.A.) is located near Delhi Gate, Aurangabad, Maharashtra, India. He was great pious personality of Sufi order of Chistiaya and his status and position is well known and famous. Due to his endeavors and preaching as well as teaching and instructions many Lakhs (one lakh = 100,000) persons were benefitted and followed the right path of Allah. Even today in sub-continent the favor of this Sufi order is still continue. Hazrat Shah Nizam Uddin was arrived in Deccan as per instruction of his spiritual master Hazrat Shah Kalim Ullah Jehanabadi for the teaching and preaching purpose. At that time the area of Deccan was passing from a difficult situation of problems in the history of India. The down fall of Mughal empire started and wars with Marathas were in progress at that time and it were at final and last stage. During that difficult time it was not easy to protect and care of the capital of the community. So for this reason for this great cause of Allah, his spiritual master has selected him as who was a great and ranked pious personality of his time. Upon his arrival into Deccan he was started teaching and preaching work and due to his hard work there was new life was born in the dis-hearted persons. All persons of caste and creed without any discrimination came into his service and their details are as follows. Due to his following great qualities he was become popular and attracted in the area of Deccan and many Lakhs (one lakh =100, 000) persons were benefitted by his guidance and favor. The Sheikh’s details of birth are still not available in the books of history. He was died at the age of 82 years and as per this record his date of birth was calculated and it found his year of birth as 1060 A.H. and he was left this world in the 1142 A.H. He genealogical record is connected with Hazrat Abu Baker Siddiq through Sheikh Shabab Uddin Suherwardi. As per reference from ‘Tadhkirta Auliya Deccan’ in which Maulavi Abdul Jabbar Khan Malkapuri who mentioned one reference from book ‘Qizan Wa Bahar’ that his name was Shah Nizam Uddin and his title was well known and famous as Sheikh Islam and he was born in the year 1070 A.H. Regarding his native place there is difference with historians in the following books and in which it was written that his native place was Purab and he came to Delhi for completion of early education there. As per reference from the book ‘Manaqbi al-Mahbubian’ that his native place is Eshian in district Purab and village Kakori and Tagron which are adjacent of Lucknow City. As per reference from Khaja Hasan Nizami and Nawab Muslah Uddin Khan that his native place is Kakori. Now it is confirmed from all sources that he belongs to Kakori village. As a matter of fact his grandfather or great grandfather Hazrat Sheikh Saadi’s grave is available in Kakur Sharif. Also compiler of the book ‘Qizan Wa Bahar’ mentioned that his native place is as follows. Village Takraun in district Purab. Hazrat Shah Nizam Uddin completed his formal education in his native place and for further education he left his native place at a age of 11 years and he was reached to Delhi and at that time Delhi was famous and well known center of learning for the knowledges of manifest (Zaheri) and innermost (Batini). Upon completion of the knowledge of manifest (Zaheri) in few years and he began his interest in the knowledge of innermost (Batini) so he heard great fame and name of Hazrat Shah Kalim Ullah and for this purpose of learning the knowledge of innermost he went into the service of the above great Sheikh of his time and he reached his shrine. At that time the ecstasy session was in progress at the shrine of Hazrat Shah Kalimullah and as per his instruction all doors were closed there and outsiders were not given permission in this matter. Hazrat Shah Nizam Uddin went the shrine building and knocked the door so the Sheikh asked his servant to go out and see who is there at the door. The servant watched that one stranger person was standing there and he asked his name and went inside of the building and inform the Sheikh all details in this matter. So upon hearing the details the Sheikh asked him to bring that person inside. So for his un-usual routine and behavior and for this reason all disciples were surprised in this matter. So the Sheikh clarified in this matter that from this person and from his name there is smell of friendliness is coming so for this reason he is not strange person. The Sheikh met with him with special sincerity and love and he was accepted the responsibility of his training of knowledge of manifest (Zaheri). Pledge to Sheikh Kalim Uddin Jehanbadi. Hazrat Shah Niazm Uddin lived in the service of his Sheikh for long period and completed his training in the knowledge of manifest. During that period one disciple of Sheikh Yahiah Madini came to visit Sheikh Kalimullah and at that time Hazrat Shah Nizam Uddin was learning there some book. When new the comer looked at the Sheikh he was become intoxicated and become out of control. With this event Hazrat Shah Nizam Uddin was very much effected in this matter and his devotion and irdat (religious zeal) was increased more. One day the Sheikh left his meeting place and reached to corner place then suddenly Shah Nizam Uddin stood from his place and took the Sheikh’s sandals and cleaned the same with his dress and presented before him with great respect and honor. So the Sheikh told him he liked his action too much and he was much effected in this matter. So at that time the Sheikh told him Nizam Uddin the learning of knowledge of manifest will be continue but now pay attention towards the learning of knowledge of innermost (batini). So Shah Nizam Uddin requested him to become his disciple by pledge him. So the Sheikh asked him in which Sufi order?. So Shah Nizam Uddin recited one Persian couplet in this matter and its picture is as follows. For this reason then Shah Kalimullah remembered his spiritual master’s saying in which he told him during his stay in Madina. When Shah Kalim Ullah visited Madina to see his spiritual master Sheikh Yahiah Madni and he was talking with him there. So the Sheikh told him that why did you come there and you should have stay there. So go back from there as there will be one Qutub (highest cadre in spiritual pivot at axis) from your chain. So Shah Kalimullah asked him whether Qutub (highest cadre in spiritual pivot at axis) will be from his sons or from disciples. So he told him that he will be from his chain of Sufi persons and he will be called as Nizam Uddin and he will come to see you in this matter. So wait for him and he will be owner of our connection .During the way if you will find any news do not go back .So the Sheikh told him there many persons are well known with the name of Nizam Uddin with this slave. So the Sheikh of Madina told him that he did not come yet but he will come and he recite one Persian couplet which is as follows. The above couplet was recited by Sheikh Yahiah Madni to his disciple Hazrat Shah Kalimullah. When Shah Nizam Uddin recited the above Persian couplet then Sheikh remembered that this couplet was already recited to him by his great Sheikh in Madina during his visit there and he was informed already him that one Qu’tub (highest cadre in spiritual pivot at axis) of his time will become his disciple. He was included him in his circle of disciples and accepted his pledge. After completion learning of Zaheri (manifest) and Baitini (innermost) knowledge and upon completion of perfection he obtained caliphate and saintly dress from the Sheik’s hands and at that time the Sheikh instructed him to proceed towards Deccan. At that time political conditions in Deccan were very worse and for this reason the persons of Deccan were migrating towards north India in this matter. Sheikh Kalimullah wrote the following details in his letter. For Sufi order of Nizamia there was no new place available. The following pious personalities were resting in land of Deccan. Hazrat Amir Hasan Ala Sanjari. Hazrat Sheikh Burhan Uddin Gharib. 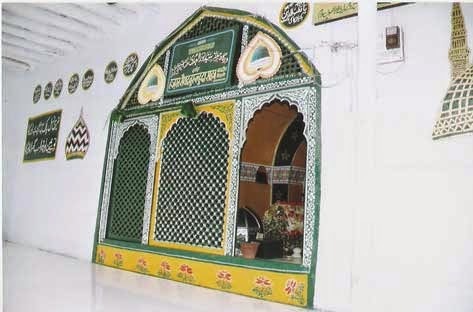 3.Khazrat Khaja Muntajid Zar Zari Baksh. During that critical period of history and he was proceeded towards Deccan to spread the Sufi order of Chistia Nizami in the area of Deccan. As per reference from the book ‘Maktobat Kalimi’ it is well known that Hazrat Shah Nizam Uddin came to Deccan with the royal army and he used to move in the area with the royal army. Hazrat Shah Nizam Uddin used to send his letters to his Sheikh through army troops and also used to receive the replies from his Sheikh in this matter. So for this reason in one of his letter Hazrat Sheikh Shah Kalimullah wrote the following details. “ In the Deccan the political situation is not good so work there with care and attention in this matter.” He was stayed in different parts of Deccan and he visited also Bejapur and Sholapur. And in this way upon covering many destinations he was finally reached to city of Aurangabad and he was settled down there permanently. So he decided to live permanently in Aurangabad and he was settled down there. Khaja Kamgar Khan was given offer for his stay in his Haveli (mansion) so he accepted his offer and shifted into his mansion. During the beginning period upon seeing huge crowd of people he was annoyed and worried in this matter. But afterwards as per his spiritual master’s advice Hazrat Shah Nizam Uddin used to meet with the persons with great sincerity and happiness. As there was instruction of Hazrat Sheikh Kalimullah that he should see all persons with favour and kindness. So he was there in Deccan for this work for the long period. He was busy in great endeavours and works for the teaching and preaching mission in the areas of Deccan and he was much successful in this matter due to grace of Allah. The above details are available from the letter number 100 on page number 79. The Sheikh used to stay in the house which has two floors and in the 2nd floor he used to stay there and also he used to busy there in the worship and on the ground floor he was used to busy in the teaching and preaching work of the mankind. On the ground floor there was one small ladies room was available in which Hazrat Moulana Fakher Uddin Mohammed was born there. As per reference from the book ‘Malfuzat Tounasvi’ that in the Sheikh’s residence there were ten doors available and on each door there was used to sit one copyist and who used to write the visitor’s desire and wishes on the papers and put the stamp of the Sheikh and on the application papers and on which there was available one Persian couplet. When the applicants used to take those papers from there to the rulers in such cases they will think it as great honour and respect for him and used to help the applicants in this matter. The doors of shrine building will be used to be opened for all persons for their help and attention in this matter. It is well known and famous event that one year there was no rainfall and for this reason there was a severe starvation and animals were become weak and near to death. So somebody requested him to pray for the rain fall so prayed for it and for the above reason he has requested him for supplication for rains. It so happened that it rained heavily. It is written in history books that when Nawab Qamar Uddin Khan Asif Jah Bahadur came to Deccan and with small number of army was there with him. So there was war with Mubarz Khan who was Subadar (governor) of Deccan and who had large number army with him. In the area of Shaker Khed Pargana in state of Barar the two armies were expected to meet together. So for this purpose Nawab Sahib visited the Sheikh and requested with him for success and victory in this matter. The Nawab told that to fight with small number army with large number of army and to keep hope of success and victory in this matter which seems impossible thing as per wisdom. As a matter of success and victory is possible due to repeat of prayers of Allah. So he told the Sheikh that he want some mark in this matter so please help him in this matter so that there will be peace of his mind for him in this matter. So the Sheikh told after short period time that on Thursday on all pavilions and tents of the camps there will be mark of open hand with sandal impressions will be available there. So this will be your mark of your success and victory. So on that day on all tents impression of open hand in sandal color impression was appeared. At last Nawab Qamar Uddin Khan was successful in this great with Mubaraz Khan and all details of this event are available in the book ‘Tadhkira Salatin Part 3’. In the beginning Hazrat Shah Nazam Uddin was much interested in books. So for this reason he used to read books all time. But upon his arrival in Aurangabad he was much busy in the following things and he left all other things. After morning prayer he used to go into the room and up to Zuhar (after noon) prayer he was used to busy there in the worship of Allah. After Zuhar (afternoon) prayer the door of the room was closed and it will be opened at the time of Asr (evening) prayer. At that time Khaja Noor Uddin used to read some parts from the book ‘Miskawat’ or any other book. After Asr (evening ) prayer books of biographies of Mashaiq (learned persons) were used to be read by Khaja Kamagar Khanand and all person who used to present in the meeting will hear the same silently. After performing Mahgrib (sunset) prayer the Sheikh used to go into his room and at that time only special persons will be allowed to enter there. At the time of Eisha (night) prayer he will be come out of the room and participate in the congressional prayer of Eisha (night) prayer and after this he used to enter into his room and used to busy there for the following things in the whole night. He did not like discussions and debates .If somebody will come to see him and ask any solution for problem then in that case he will ask him to refer some book in this matter and asked that person to study book in this matter. He never used to eat the food lonely. Hazrat Shah Nizam Uddin will not care in the dress matters and whatever available he will used to wear the same. In his dress there will be always many patches. He used to ask for the dye of his dresses in earth color. For the Friday prayer he used to wear frilled gown and turban. In the house he used to wear cap and turban. He used to go for Fridays prayer always by walking and some time he will ask the horse from somebody. He was well known and famous for his good manners and conduct. He used meet with all persons whether he will be known or un-known with good manners and conduct. He used to offer him something to eat and if nothing available in the house then in such case he used to give some scent. Nobody did not left without empty hands from his meeting place. The visitors who will visit him and due to his prayers and due to kind grace of Allah their desires and wishes will be fulfilled. He was also famous and well known for the following things. Nobody did not saw him in sitting position on the cross legged in the general and special meetings. He was always used to sit on the sitting position of two legs. Some of his advises are as follows. He thinks hurting anybody is as a great sin. So he advice all persons to avoid it. He used to be silent and he prefer it. He used to talk as per requirement. His life was a sample of simplicity. The Sheikh used to be away from kings and rulers and did not meet them and if he will accept their gifts then at the same time he will use to distribute the same to poor and indigent persons and never keep anything with him or with his relatives. As per one tradition Hazrat Skeikh Kalimullah’s instruction he used to accept the presents from the persons and used to give to the poor persons. Hazrat Sheikh Kaleemullah told that there will be heartbreaking of persons so if any person present anything in gift with sincerity then he will use to accept the gifts and give the same to poor and deprived persons. In the matter of Samah (ecstasy) he used to follow the rules and regulation of his spiritual master. He used to take care of time and place and disciples in these meetings. In these meetings there will be observation of the following things. On every Friday after Friday prayer the meeting of Samah (ecstasy) will be conducted. In such meetings always some needy person used to be present there and due to his favour there will be fulfillment of their desires and wishes and his shrine is place for the unfortunate persons for the fulfillment of their desires and wishes. One day he was arranged the meeting of Samah (ecstasy) on the occasion of Urs (death anniversary) ceremony of some pious personality. In the meeting one person who was among professional reciter started reciting Arabic poetry and at that time one Maulavi Saheb came there and he began his objection for recitation of Arabic poetry. So the Sheikh tried his best to convince him in this matter but due to his un-advisability he was not satisfied with his explanation. He told him while treating with him as per his kindness of hospitality that this is meeting place of ecstasy (Samah) and it is not for the time of discussion. Due to his best handling the discussion was stopped at the time of ecstasy (Samah). He asked his name and Maulavi Saheb told him his name as Abdul Ghani. So he told him it is not good to say false name to darvesh person. So he told him his name as Abdullah so he become silent in this matter. The Maulave Sahib came to see him after three days and the Sheikh told him to have discussion at the time of ecstasy (Samah) is against the manners. So please tell your opinion in this matter. So that he will explain him in this matter. Maulavi Saheb regretted him that he was understood the point at the same time so now he came there to see him for his regret in this matter. The Sheikh smiled and told him to inform his name ? Then Maulavi Saheb told him his name as Abdullah. So the Sheikh told him his name is not Abdul Ghani or Abdullah and he told him the following correct details. His house address and street name. Upon hearing all his history record by the Sheikh the Maulavi Saheb put his head down on his foot and with sincerity become his disciple. Training and teaching of disciples. As per instruction of Hazrat Sheikh Kalimullah he used to do spiritual training of the disciples. The Sheikh used to say that the purpose of creation of mankind is worship only. So he used care too much for the following things. Daily round of prayer formula. He used to go and see the disciples in the midnight time and used to wake up the sleepy disciples. He was taken too much importance for the following things in his spiritual training of his disciples. Zikar (remembrance of Allah) Jahri ( in loud noise). He used to say that with the help of the above things the training of Batini (innmermost) is possible. He also used teach the disciples for the following things. He used to say that Hazrat Nasir Uddin Chiragh Delhiavi used to beat the disciples for their training purpose but his disciples never left him. Now such time has come that if the Sheikh say something to his disciple then he will become upset in this matter and leave his spiritual master. Hazrat Shah Nizam Uddin did not like pride and he did not used bead (Tasbih). He used to say that in his inside there is bead (Tasbih) so he is busy with that thing. As one who has bead of innermost (Batin) then he will not hold bead (Tasbih) of manifest (Zaheri). He was died on 12th Ziqad in the year 1142 A.H. at the age of 82 years in Aurnagabad. He was buried in the compound of his shrine building. Nawab Mir Qamar Uddin Khan Nizamul Mulk Asif Jah constricted the following buildings. When Shah Nizam Uddin came to Deccan he was not married at that time. Upon reaching Aurangabad he spent some period of life as bachelor. As there was instruction for him from his Sheikh Kalim Ullah Jehanabadi to avoid marriage if there is no requirement. But as per his health condition the Sheikh was given him permission to marry. From his first wife there were four sons and four daughters were born. Hazrat Shah Nizam uddin’s four daughters were buried at the foot side of his tomb and out of three sons one son was left for Calcutta and he was settled down there and it is said that his children are available there. Hazrat Shah Nizam Uddin upon the death of his first wife married with Hazrat Syeda Begum Sahiba. She was great granddaughter of Khaja Bande Nawaz Gesu Daraz. From her one son was born who is known as Fakher Uddin and who become proud of Muslim Nation and his name was Moulana Fakher Uddin Mohammed . He was very young at the time of death of his mother and when his father left the world then he was 15 years old. Hazrat Moulana Fakher Uddin Mohammed was died on 17th Jamid Akhir in the year 1199 A.H. and he was buried in the compound of shrine of Hazrat Bakhtiar Kaki and he was 73 years old at that time. The historian wrote that the Sheikh had many caliphs and for their training he worked hard and did many endeavours. Some famous caliphs are as follows and all these pious persons are resting in Aurgangabad. There were many books of biographies are available about Hazrat Shah Nizam Uddin. One book with details of the events of the life of Sheikh was written by Nawab Qamar Uddin Nizamul Mulk Asif Jah first and its title is known as ‘Rashke Arm’. This book was seen by Moulavi Rahim Baksh who wrote his book ‘Shajrat Anwar’ with Hazrat Haji Wasil who was caliph of Hazrat Moulana Fakher Uddin Mohammed. Another book with life details of Hazrat Shah Nizam Uddin was written by Khaja Kamgar Khan and its title is known as ‘Ahsanal Shamil’ and also in the following books his life details are available. Devotion of King Asif Jah . Upon conquering of Mubaraz Khan’s army Nawab Qamar Uddin Khan went to the Sheikh and he offered him one paper to the Sheikh so he was given him back the paper and told him “Qamar Uddin when the full is not acceptable to him so what he will do with half of it”. It was certificate of half of his kingdom. Again he told him that what will darvesh do with it. As he used to follow the policy of new day with new food provision as he used to live on the trust of Allah and for this reason you have become the King of Deccan. When Qamar Uddin started to live in Aurangabad then the Sheikh told him that “Qamar Uddin due to your stay here the darvesh will face difficulties in this matter as the people will come to see him as he is your spiritual master for recommendations.” So it is better that you should proceed to Deccan. So Qamar uddin told him that “His throne is in his feet.” Upon this he was presented one stamp and requested him to put stamp on the plain paper when any needy person will come to see him in this matter and in this way that person’s desire and wish will be fulfilled by him. So he told him “Qamar Uddin he did not have time to put stamp on the papers and the person who will get his desires from invisible source what he will do with it”. So Qamar Uddin helplessly given order to Kamgar Khan who was disciple of the Sheikh to hang the stamp on the door of the shrine. So as per his order the stamp was kept hang on the door of the Sheikh’s house building. Once one person prepared one forgery bond paper of loan with details in it that an amount of Rupees of one Lakh (one Lakh =100, 000) was taken by Hazrat Shah Nizam Uddin so this amount should be re-paid to him from the Royal Treasury as per rules and regulations. That person put the stamp on the bond paper and he was presented the bond paper to Nawab Qamar Uddin Khan. Upon seeing the bond paper Nawab Qamar Uddin Khan went to see the Sheikh and told him with folding his hands that your honour you have treated this slave not fit for your service and you have taken the loan amount from another strange person. So the Sheikh told him that he did not taken loan amount from him but the stamp belongs to him. In this matter darvesh told him already that there is no need of stamp for him but you have not agreed in this matter and you left it on his door. So now you should handle this work as per you wish and desire in this matter. So give him one Lakh Rupees amount and take away your stamp from my door. At that time the amount was paid to that false person and he took away the stamp from there. After some days Nawab Qamar Uddin Ali Khan submitted his requested with the Sheikh that he want to construct one building for him with the cost of three Lakhs Rupees (one Lakh = 100,000). So the Sheikh told him that he did not seen such a huge amount so bring the same in his presence. So he ordered the treasurer to bring the amount there at once. The amount was brought there in the presence of Sheikh and the coins were in packing of 1,000 coins in each bag. So the Sheikh distributed all money to poor and needy persons. Qamar Uddin was silent till the distribution of all amount and he did not say any word in this matter. Upon distribution of money he told him that sir you have asked to see the amount but you have distributed the said amount. So the Sheikh told him that you were intend to construction of the building so in how many years it will be completed.? He told him that it will be completed within the period of three or four yours. Upon this the Sheikh told him that he made his work easy and such building was completed within a period of three hours and your wish and desire was fulfilled as well as my purpose was also completed. The building was completed where it was required and it will not be damaged by the effects of the time. When Nawab Qamar Uddin Khan was received title of Asif Jah from Sultan of Delhi so he went to see the Sheikh and informed him that he was intended to return back this title to the Sultan of Delhi. The Sheikh told him why he did want to return back it.? Qamar Uddin told him that as the Sheikh did not accepted so far any offer from him so for this reason he want to return back it. When there will be no connection of the Sheikh with this title he will not accept the same and most probably this thing was told him by his heart. So the Sheikh was silent for some time and told him “ Qamar Uddin you should be responsible in this matter that it should not come into the history record and this is your matter so you should give word to him in this matter’’. So in this way he was accepted his offer. So Nawab Qamar Uddin Ali Khan told him that he will take care in this matter and he told him further that the kingdom which was given by him to this slave so it will be called with Sheikh’s name and the color of the kingdom will be yellow as per the color of the Sheikhs shrine. In this way the kingdom of Qamar Uddin was become well known and famous in the world as follows and he was adopted the color of kingdom as yellow. On the demise of Hazrat Shah Nizam Uddin, King Asif Jah First constructed the following buildings in the shrine of the Sheikh in Aurangabad. In the year 1748 A.H. Nizamul Mulk Asif Jah First was left this world.